A journey of triumphs and challenges, life and magic. A life of awareness and acceptance. A gift of Down syndrome. As I have written in the past, Alex learned sign language as a very young baby. It saved us and her months of frustration as she figured out how to get her brain and month to coordinate to speak. Instead she used her hands, and we understood her wants and needs. Following is a guest post from Baby Sign Language. I highly recommend it! Children with Down syndrome are often quick to develop their receptive language skills. They understand what we adults are saying, sometimes before we really want them to! But expressive language can be a whole different story. And when children can’t express themselves the way that they want to, it can be incredibly frustrating for both children and caregivers. This is one reason why sign language can play such an important role in communicating with children with Down syndrome. Children who can’t yet speak can often learn to sign! And children can start learning signs when they are still babies, which can pave the way for easier communication for a lifetime. However, don’t worry – if you didn’t start signing when your child was a baby, it is never too late to start! And don’t be baffled by the nomenclature. “Baby” sign language is not some tricky, mysterious language designed for infants. It is simply grown-up sign language with smaller hands. A few of the more complicated signs can be modified for children, but for the most part, a child’s approximation of the signs can be “heard loud and clear”! Each country has its own corresponding sign language, but all sign languages are based on intuitive gestures, and most of these can easily be used with kids. Another bonus for children with Down syndrome is that they are very often visual learners. They will likely surprise you with how quickly they pick up a sign’s meaning. Then, it’s only a matter of time before they are using the sign themselves. And even when children do start learning to speak, they may still struggle with pronunciation and articulation. Signing can continue to help them clarify themselves, which can further prevent frustration. In addition to all the educational stuff, signing with your children is simply an awesome bonding experience. It is truly fun. It leads to all sorts of new games, traditions, and private jokes. Families end up signing when they sing, when they read, and when they’re on opposite sides of the playground. There’s nothing quite like seeing the joy and pride in a child’s eyes when she successfully communicates with you. And there’s certainly nothing like the fullness in your heart when a child signs that he loves you! If you are interested in learning more about sign language, please let us help! We offer an online baby sign language dictionary (based on American Sign Language), printable flash cards, and a printable wall chart. We also offer video demonstrations for many pertinent signs. The best part? All of this is 100% free. BabySignLanguage.com is here to help we are perhaps the largest most active sign language for babies community and we have a soft spot for children with Down syndrome, so if we can be of any help to you, please ask! Thanks for your note, we love hearing from you! Would you like to read and review the book? Leave a comment and I will contact you right away. Gary has not been on the Today Show or Oprah ....more evidence of her spirit and determination. I would highly recommend this book as essential reading. 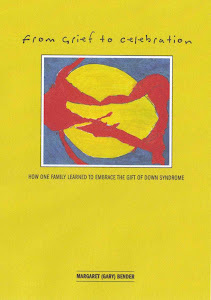 I would recommend to any parent of a child with Down syndrome looking for a memoir that takes them farther down the road, beyond early childhood and into adolescence. I can't think of anyone who wouldn't benefit from reading this book, It is extraordinarily well written from the heart of a mother with three children, including one who happens to have an extra chromosome. The book--a quick read--is organized according to a list of verbs that Gary believes has defined their experience. The verbs she uses, numbered from 1-10 plus the bonus, are relatable to parenting and, frankly, life in general. I give this book my highest recommendation. Read it…and follow her blog too! You'll grow from them, I promise! Check out our favorite deals! Lots and lots of awesome blogs! 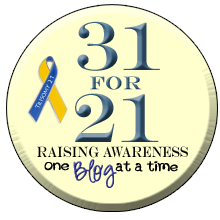 The T21 Writer's Alliance - a great resource! "Mom, I made three friends"
Do you have the right information? Thanks to all our readers! Our favorite adults, teens and pre-teens! How to Reinvent a Life: Happy Birthday Jessie! Netbuddy (www.netbuddy.org.uk) is a practical resource and a social networking community,providing vital support, 24 hours a day to the special needs community – right around the world!